Volunteering is what keeps USDTC going! We are a volunteer-run organization, from the Board of Directors, to the instructors, administration, and even maintenance of the building and web site. This is OUR club! Dog training classes generate revenue that pays a portion of our bills. But what really keeps a roof over our heads and our lights turned on are the trials we hold. Primarily it's the agility trials but also obedience trials and conformation shows. As a member, you have rewards as well as responsibilities. Attending general meetings, voting and volunteering for USDTC are the main ways you can support our club. We are always looking for ways to improve and grow, but we can't do that without an active membership. Here are some examples of USDTC endeavors throughout the year, which all require a volunteer effort. Agility Trials - Three AKC outdoor events are sponsored by USDTC. Currently one is held in January at a covered facility in Tampa. The other two are held in April & November in a covered facility in Palmetto. For agility trial job descriptions, click here. Obedience/Rally Trial - One AKC event is sponsored by USDTC. It is held indoors in July in St. Petersburg. For obedience trial job descriptions, click here. 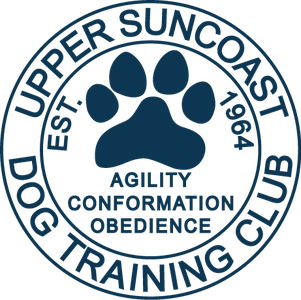 UKC Conformation - Currently one show is sponsored by USDTC in our own facility in July. Awards Banquet - A dinner banquet to celebrate titles our members have earned through AKC and other registries. This event is held in late winter/early spring. Holiday Parties - USDTC typically celebrates with a Holiday party in December (2 legged members only) and sometimes a Halloween party (four-legged friends welcome). DACOF - Dog Agility Competition of Florida. Teams from across the state of Florida participate in a friendly competition unique to Florida and held in Kissimmee. This event takes place on the last weekend in June and USDTC usually sends at least one team comprised of 9 dogs and handlers. DOCOF - Dog Obedience Clubs of Florida. This competition is for all the clubs of Florida. USDTC sends at team each year. The event is held in September in Kissimmee. Responsible Dog Ownership Day - Annually or bi-annually USDTC supports AKC's effort to get the word out about responsible dog ownership. This is also a good opportunity to market our club and let people know what we offer. In the past we have married this event with an Open House in October. Going forward we are considering an event dedicated to rescues to celebrate RDOD. Olympic Summer Games - This has become an annual event where we play fun obedience & agility games. Typically held in August in our facility at USDTC. Last year the event benefited the Canine Companions for Independence for Wounded Veterans. Dog Events/Marketing - Sometimes USDTC will participate in rescue or other dog events such as the Largo Pawfest. We offer information about our club and sometimes perform demos. Seminars - Recently we have begun an effort to bring a variety of seminars to our facility. Not only is this a perk for our members & students, it also brings new people to our facility and builds a positive reputation for the club. If you have an idea to bring to the club or an area in which you would like to volunteer, let us know!